"Oh dear, coconut is a nut?" Um, yes. And I've actually heard that - several times. I have food allergies and often cannot eat at the parties we attend, and therefore always eat first. However, I have found that this seems to offend many hosts. I would like to say up front that I never expect hosts to prepare a menu just for me. Quite the opposite, I would rather eat at home and then come enjoy the company and not worry about the food. However, this has yet to work. I usually end up trying to explain to a frazzled host why I can't just pick the slivered almonds out of the green beans. With the holidays parties just around the corner it seems like a good time to blog about the perils of food allergies. Today I am going to focus on peanut/ tree nut allergies since they are very common and are often most severe. 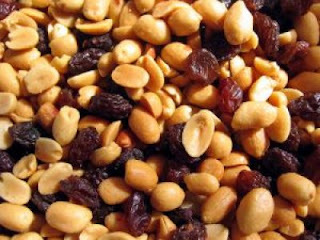 A person with a nut allergy may have reactions ranging from hives and sneezing to anaphylaxis. Anaphylaxis is a sudden, potentially life-threatening reaction that can make someone's throat swell shut and blood pressure drop. An anaphylactic reaction can be fatal if the person isn't able to get to a hospital soon enough. Having an EpiPen helps, but it is not a substitute for an emergency room and may not be enough to stop the reaction. While I'm always careful to tell the host/hostess ahead of time about my food allergies, one would be surprised how often it is a problem. It's never that a bowl of nuts is sitting on my plate. Most of the major reactions I have had are because people don't pay attention to ingredients. Chocolate that contains hazelnut paste will cause a reaction. Almond extract comes from almonds. Peanut butter is made from peanuts. A dear friend of mine once went out of her way to make Special K bars with creamy peanut butter instead of chunky, since she knew I was allergic to peanuts. and bit into a nut. Her response: "Oh, that's a walnut, not a nut." True story, folks. But the single biggest problem seems to be cross-contamination. Which brings me back to the beans with slivered almonds. Even the slightest trace of the nut can cause a reaction. Nut-free cookies on the same plate with peanut butter cookies are dangerous. Cashews cannot be picked out of the salad, the whole thing is contaminated. I've found it's been helpful to have people think of nuts as poison. Would you expect your guests to pick cyanide out of their salad? Would you put cyanide on the same plate with the sugar cookies? Would you handle cyanide and then chop fresh vegetables without thoroughly washing your hands first? To people with food allergies it really is poison. It is serious. - Ask you guests about food allergies. Most often guests with severe allergies will tell you, but ask just in case. -Ask your allergic guest to bring a dish and/or dessert that they can eat. It will guarantee that there is something for them and it will be one less thing for you to prepare. -If you a serving a large group clearly label the food items that contain common allergens. This is particularly important if it is not obvious. Earlier today I was at the Thanksgiving fellowship meal our church has every year. There was a dish of what looked like squash. Fortunately there was a sign on the dish that read "CONTAINS PEANUT BUTTER." I would have never guessed that. -Read food labels. The FDA now requires food allergy information to be included on food labels. Please check the ingredients list.It will usually say what allergens it contains. If it says "manufactured on shared equipment that also processes nuts" (cyanide) this could be a problem. - Remember that things such as hazelnut paste, almond extract, almond bark, and peanut oil are all made from nuts/ peanuts and will cause reactions. - If you are serving dishes or desserts that do contain nuts please keep them safely away from the other food. If your guest is severely allergic, it might be best to avoid it all together. Even shaking hands with someone who just ate a couple of peanuts can be harmful. -All of these things can also apply to other food allergies. Someone who is allergic to shellfish cannot pick the shrimp out of the pasta. -And please, please do not be offended if they only eat what they have prepared. For those with severe allergies, it is the safest way to enjoy the holidays. I hope you all have a wonderful Thanksgiving and holiday season.